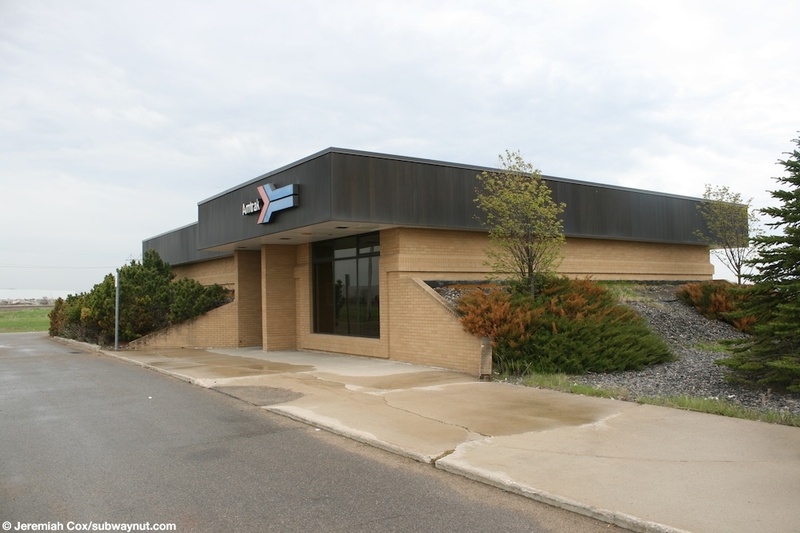 2015 Unstaffed Status: Effective Monday, June 1st, 2015 with the retirement of the long time ticket agent Mark Sivertson, Grand Forks became an unstaffed station with all baggage handeling and ticket sales discontinued. 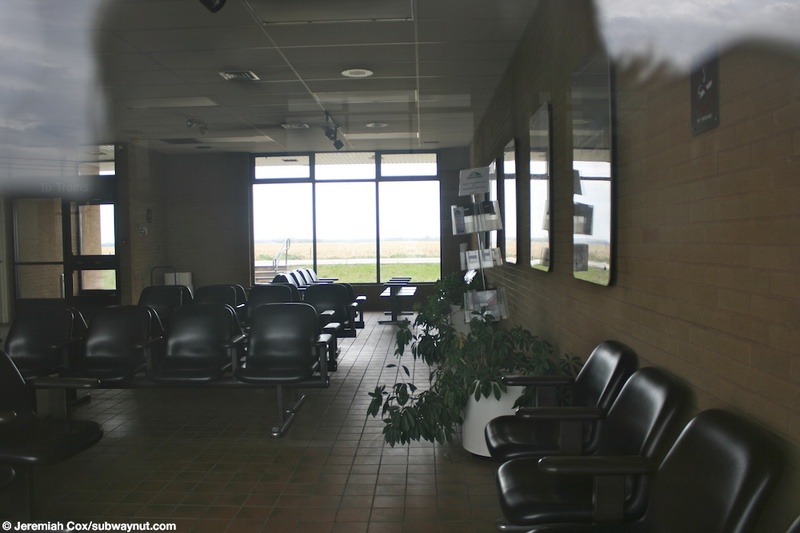 The station building remains open and closed by a caretaker for passenger use. 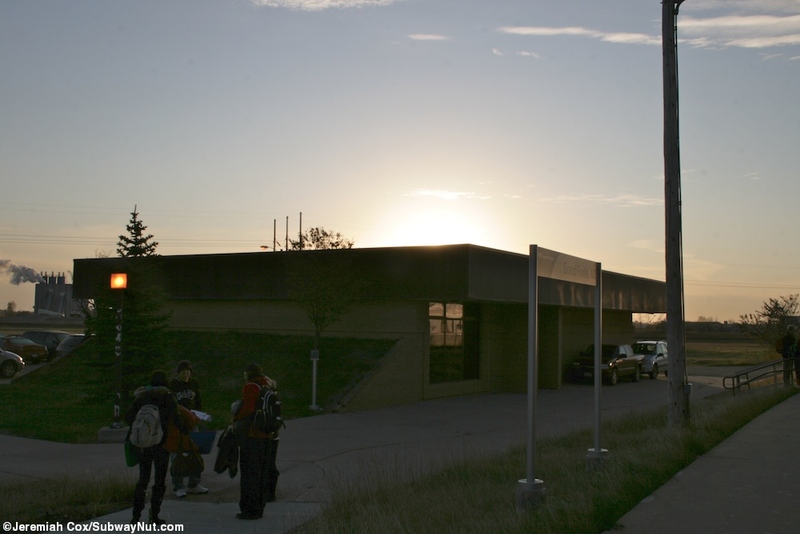 (grand_forks1) Approaching the small Amtrak station building for Grand Forks, ND from the station's relatively large parking lot. 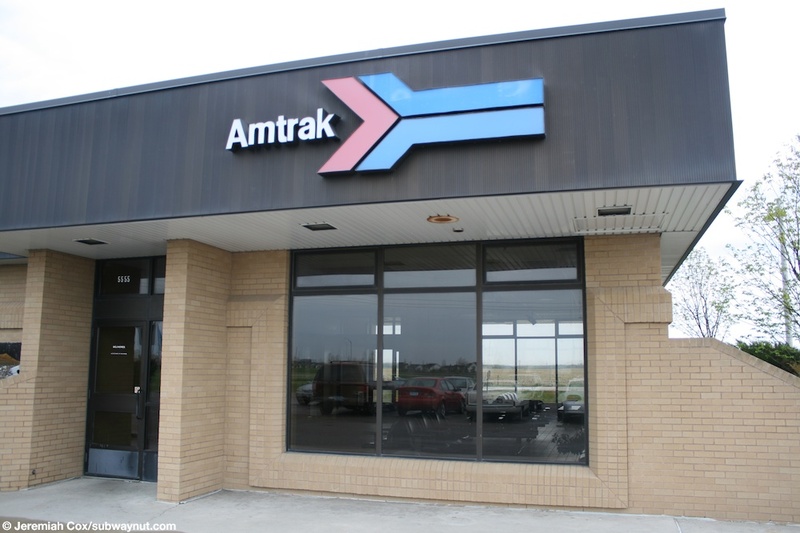 22 May, 2009 (grand_forks2) A large pointless arrow Amtrak logo on the side of the over hanged black roof at Grand Forks, ND. 22 May, 2009 (grand_forks3) Looking through the widow at the decently sized station waiting area (which is currently closed) and the door out to the platform beyond at Grand Forks, ND. 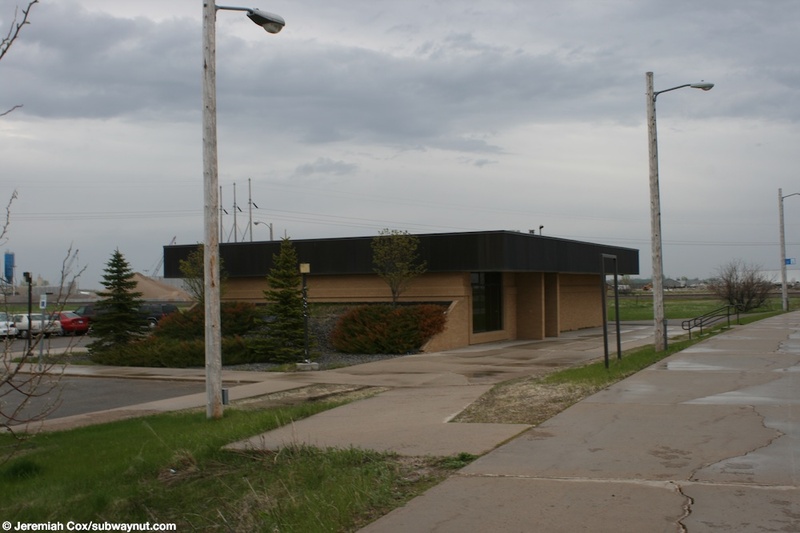 22 May, 2009 (grand_forks4) A trackside view of the station house at Grand Forks, ND, a small staircase leads up to the curving platform. 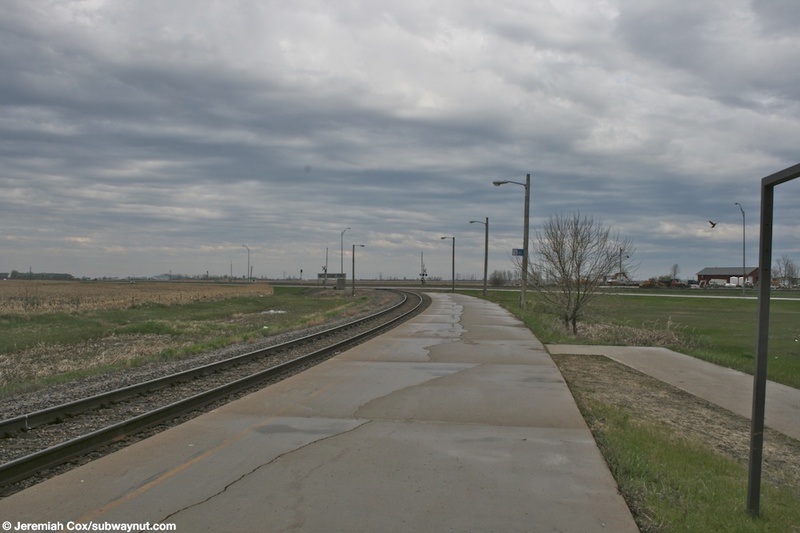 (grand_forks5) Looking down the long and curving Grand Forks, ND platform. 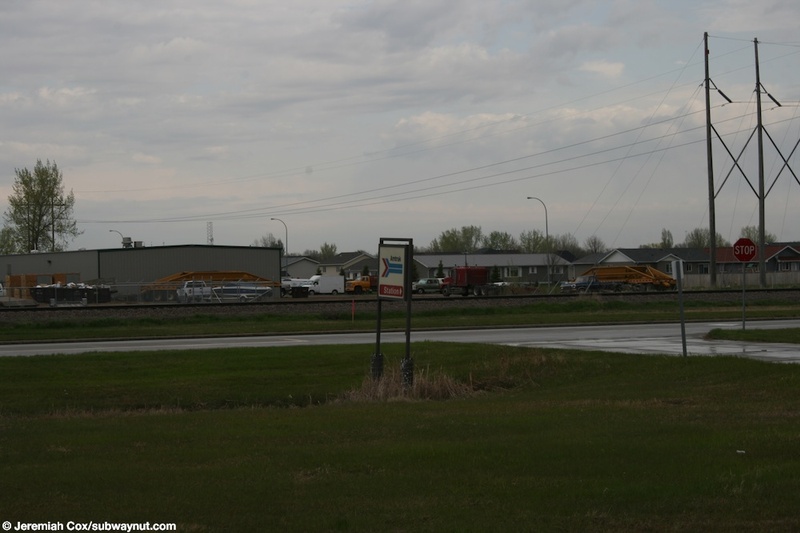 This view shows how the station is on the edge of the suburbs of this city and a farmer's field is off in the distance beyond. 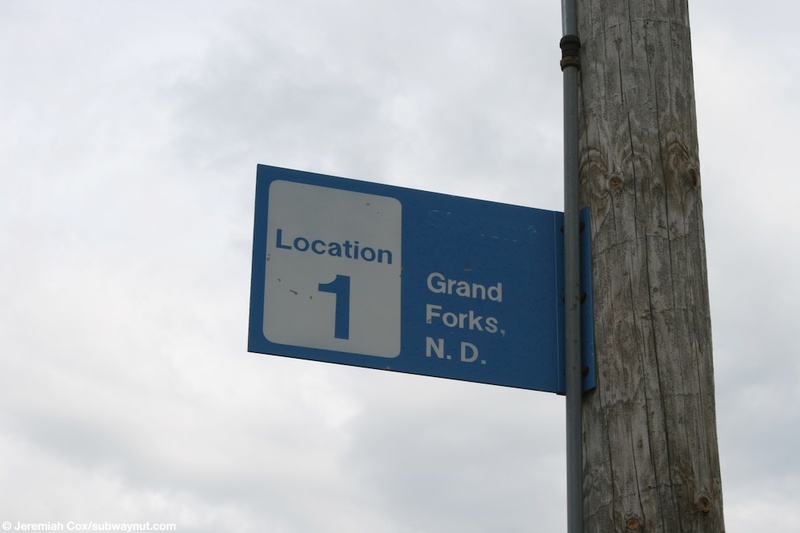 22 May, 2009 (grand_forks6) The only signs on the platform that say Grand Forks, ND are these location ones. 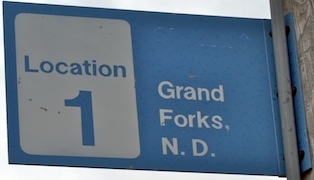 22 May, 2009 (grand_forks7) The Amtrak Station sign at the entrance to the parking lot and station at Grand Forks, ND. 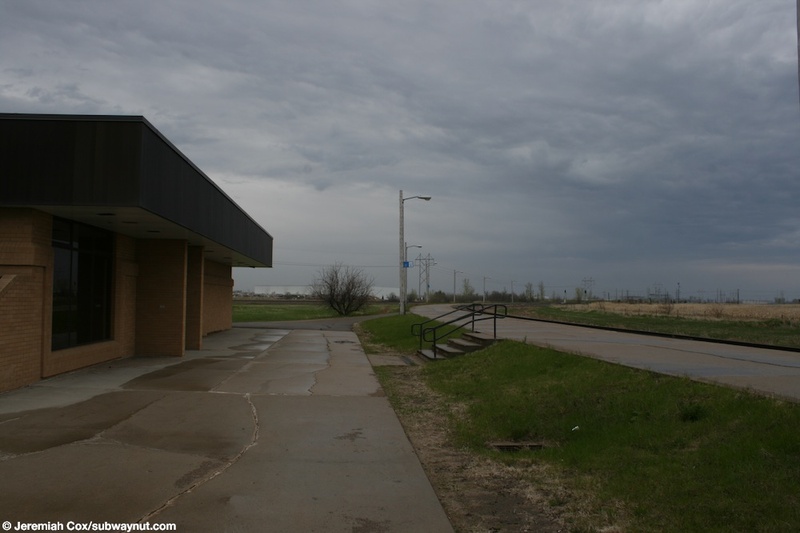 22 May, 2009 (grand_forks8) Looking from the platform to the small Grand Forks, ND station building. 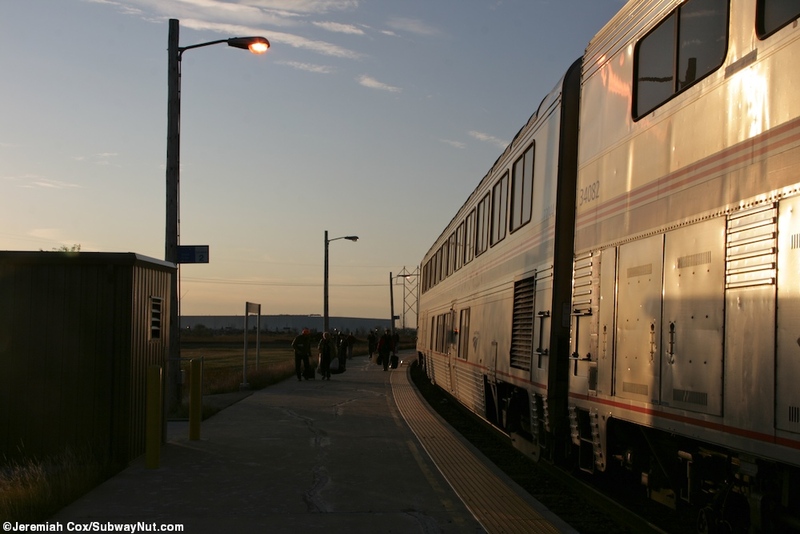 (grand_forks9) Passengers get off the just arrived Empire Builder running almost 8 hours late. 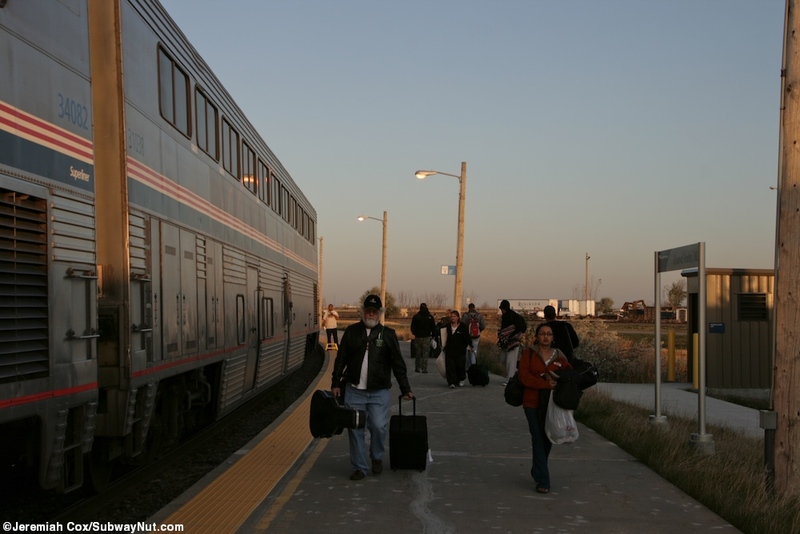 21 October, 2011 (grand_forks10) Passengers walk off their train towards the station building. 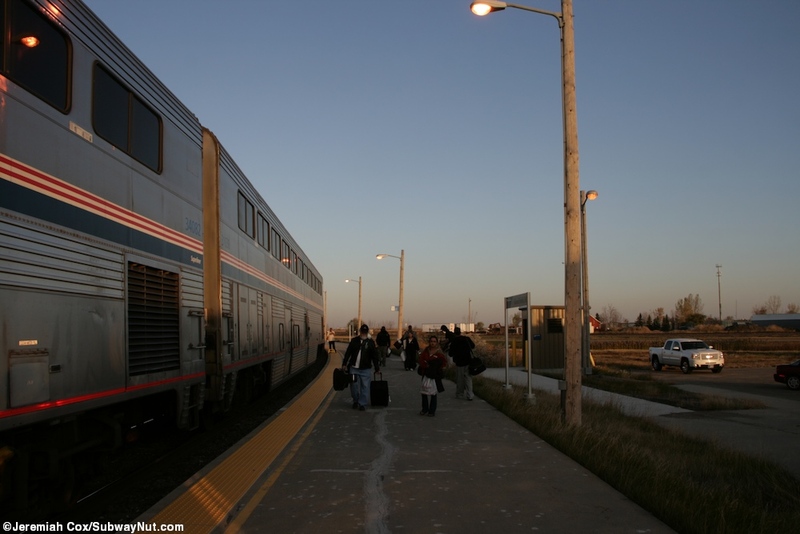 21 October, 2011 (grand_forks11) The sun glistens off the Empire Builder (a rare sight at Grand Forks). 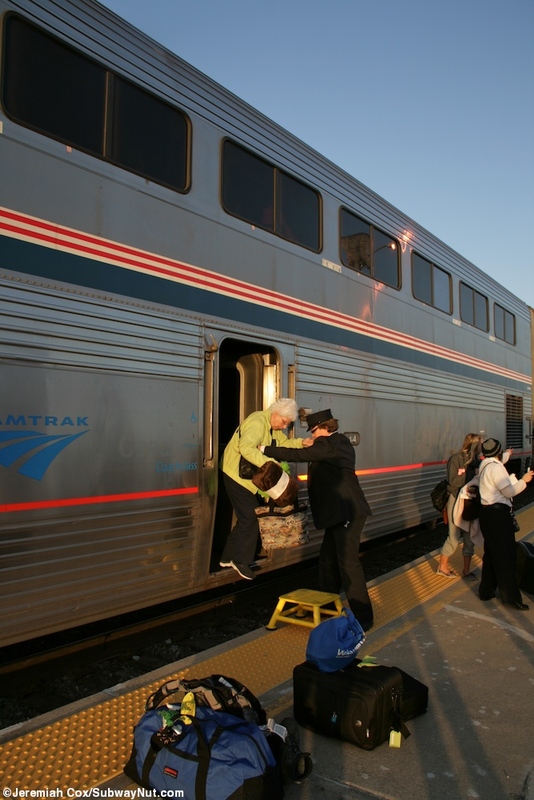 21 October, 2011 (grand_forks12) A passenger is helped off the Empire Builder. 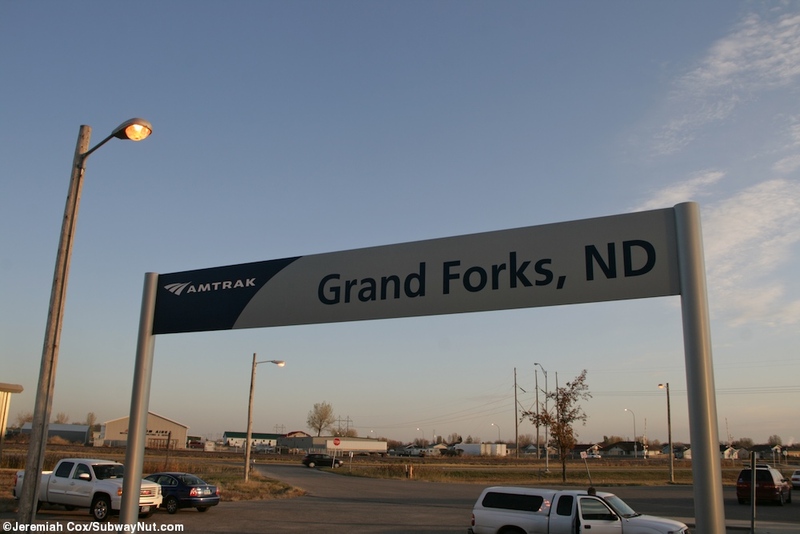 (grand_forks13) A modern Grand Forks, ND platform sign. 21 October, 2011 (grand_forks14) A modern platform sign in front of the 1982 station house. 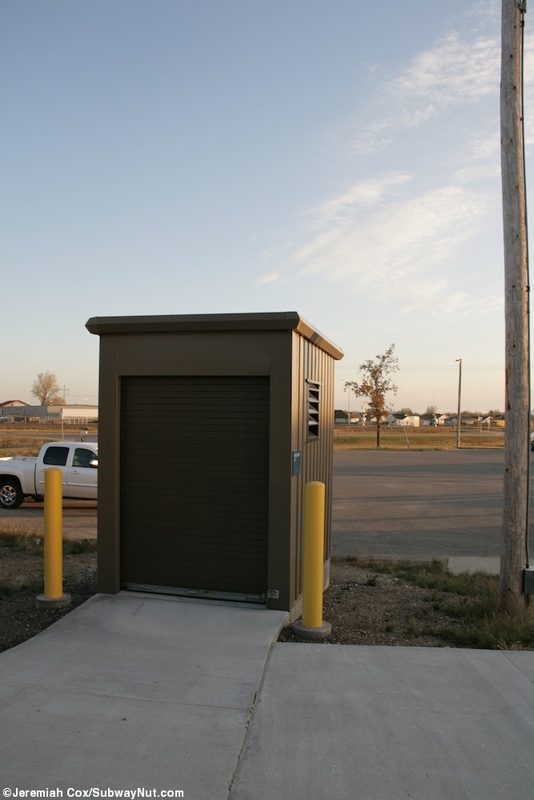 21 October, 2011 (grand_forks15) The new wheelchair lift enclosure with the two yellow bollards to avoid anything running into it on the renovated ADA compliant platform. 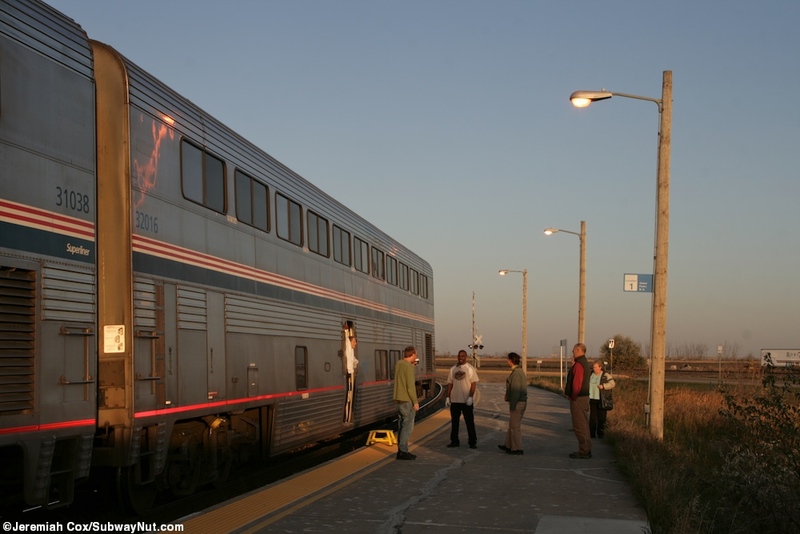 21 October, 2011 (grand_forks16) Portland Sleeper Car Passengers residing in Superliner-I #32016 get off to enjoy some morning air.